Watch out Google, here comes Nissan: The Japanese car maker has unveiled a concept car based on the all-electric Leaf that is able to drive and park itself. The car, on show at this week’s Ceatec exhibition in Japan, promises an end to one of the most frustrating things a driver has to do: cruise around a packed car park looking for a space. The advanced functions on the car are controlled from a smartphone. When the driver gets to his destination, rather than look for a parking spot the driver can tap a “park in” button on his smartphone car app and leave the rest up to the car. In automatic driving mode, the first thing the car needs is an accurate map of its surroundings. That’s fed over an LTE data link that the car relies upon for all its communications. Then the car pulls in images from four high-definition cameras placed around its body and attempts to recognize its location. This is a more accurate method than using GPS, according to Nissan. Once the car is sure of its location, it can move forward looking for a parking space. When it finds one, it parks itself. All the time, the driver can be away running errands. In a demonstration at Ceatec, the car drove at about 5 kilometers an hour while in automatic driving mode. 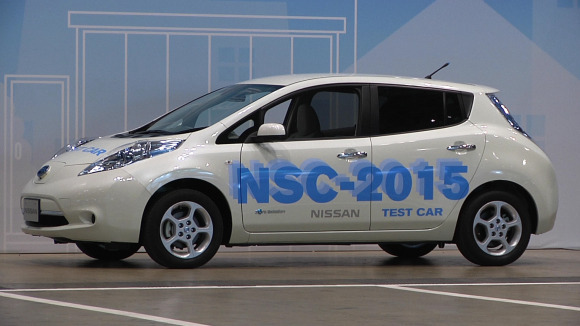 At present the intelligence to do this is running on two PCs in the trunk of the Leaf, but Nissan engineers are working on miniaturizing the system. As a concept, it’s still some way from commercialization but the large “2015” painted on the side of the demo cars is an indication as to when it may be available. Car makers around the world are beginning to experiment with self-driving cars, but it’s Google that is perhaps best known for the technology. It has been testing a self-driving car system on California roads for some time and the state recently became one of a handful in the U.S. to formally recognize the cars in its laws. Self-driving cars are still not permitted by Japanese law, meaning the technology might break out onto the road first outside of Nissan’s home market.